where do i begin to tell malki’s story? perhaps at the age of eleven when she shared the burden of caring for haya, her youngest sister, suffering from global and profound retardation as well as an extreme epilepsy condition called lennox-gastaut. or maybe at the summer she voluntarily helped a single mother care for her disabled child suffering from the degenerative canavan’s disease. perhaps better to begin at school where she helped a group of learning disabled girls who studied in a separate but parallel class. 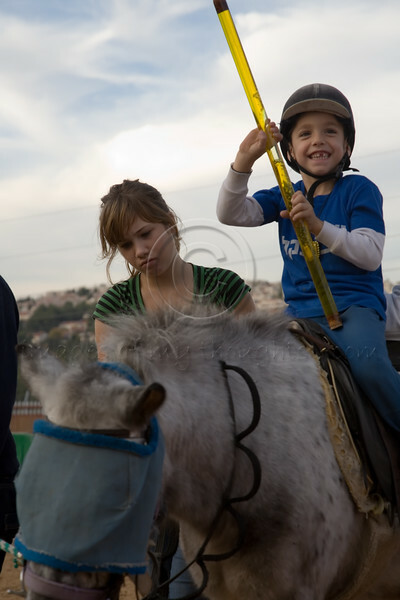 or better yet at her last summer when she volunteered at a sports camp for disabled children in the north of israel. or does this story begin precisely where malki’s life tragically ended? on august 9th 2001 izz al-din shuheil al-masri, a resident of the village aqaba north of tulkarem, walked into the sbarro restaurant in jerusalem and blew himself up. this was summer vacation, noon time. the restaurant in jerusalem’s busy central district was full of customers. sixteen of them were massacred, malki among them. 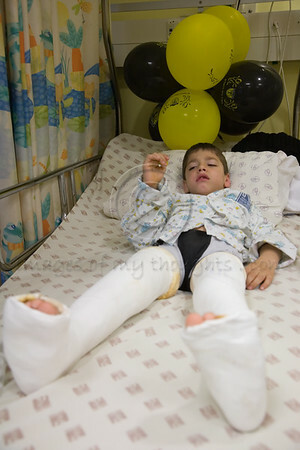 over a hundred were injured and maimed in the barbaric, hate inflicted, attack. malki, just fifteen years old at the time, was a beautiful, loving, happy and optimistic young woman, just beginning life. malki was so young, yet she left a legacy that could not be ignored. in her life and in her death malki commanded the awareness to the suffering of others less fortunate than herself. she endowed to her family and friends the importance of satisfaction of giving to others. this is a story of hate inflicted death nurturing love and giving, nurturing life. on july 22nd i wrote about a letter i received by email in which arnold roth rebukes n.y. time’s decision to illustrate the article ‘hot house’ on palestinian prisoners in israeli jails with a glamor style photo of a smiling ahlam tamimi. i don’t usually delve into mass addressed emails but for some reason this one caught my attention. i surfed into the malki foundation internet site and became engrossed and captivated for over a week. thoughts about malki and the foundation haven’t left me since and it seems they have become a part of my life for the foreseeable future. i had the honor of meeting frimet (mother), arnold (father) and haya (sister) roth in their jerusalem apartment a few weeks ago and i was deeply affected. 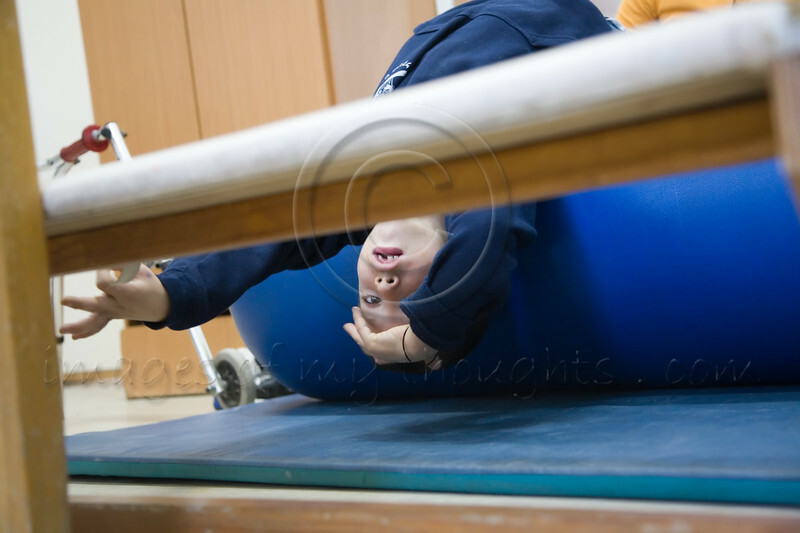 haya, age 14, malki’s little sister is extremely disabled. over the years the roths have been conducting a brave struggle to love and care for haya in their home. apparently, all government institutions find it cheaper for children in such situations to be committed to institutions. families that do not comply with this policy often find themselves caring for their child on their own, with very little governmental support, if any. malki had a very special relationship with haya. a relationship that enabled malki to share frimet’s burden of caring for haya at home – neither the relationship nor the burden obvious or to be taken for granted. 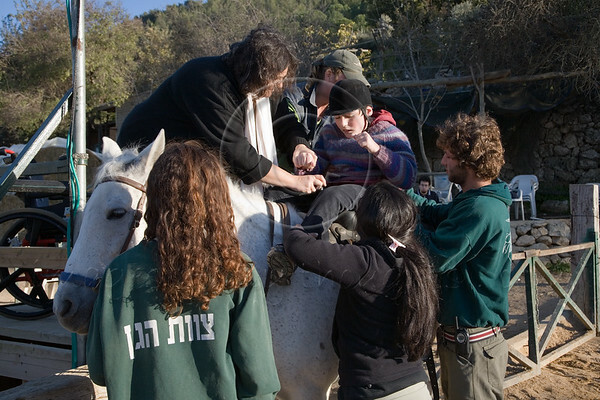 over the years malki developed an acute awareness for the suffering of others and devoted herself to voluntary care for handicapped and sick children. she was a very special young woman who left behind an undeniable legacy. 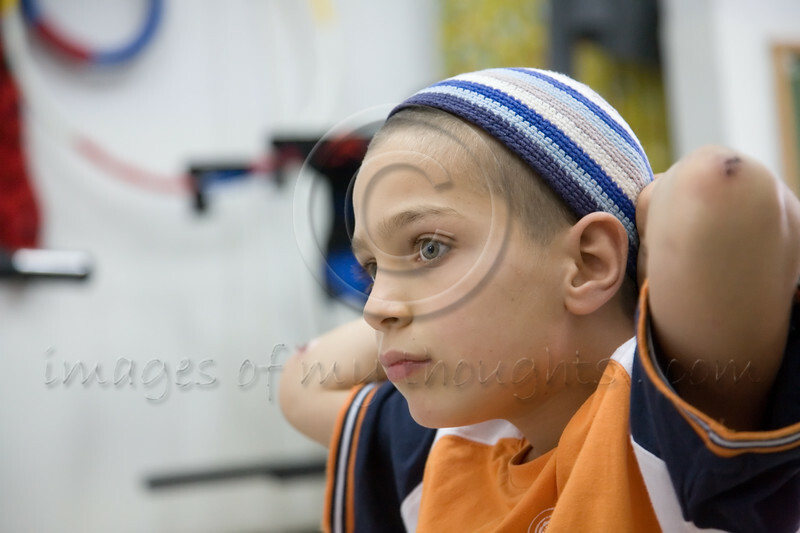 since malki’s tragic death on august 9th, 2001 the roths have climbed out of deep grief, combining their private struggle for the care of haya with strength drawn from malki’s legacy and directing these forces for the benefit of families with children suffering from neurological disorders, severe illness and developmental problems. the malki foundation, established in 2001, serves as a living memory to a young woman who dedicated herself to the care of others less fortunate than herself. 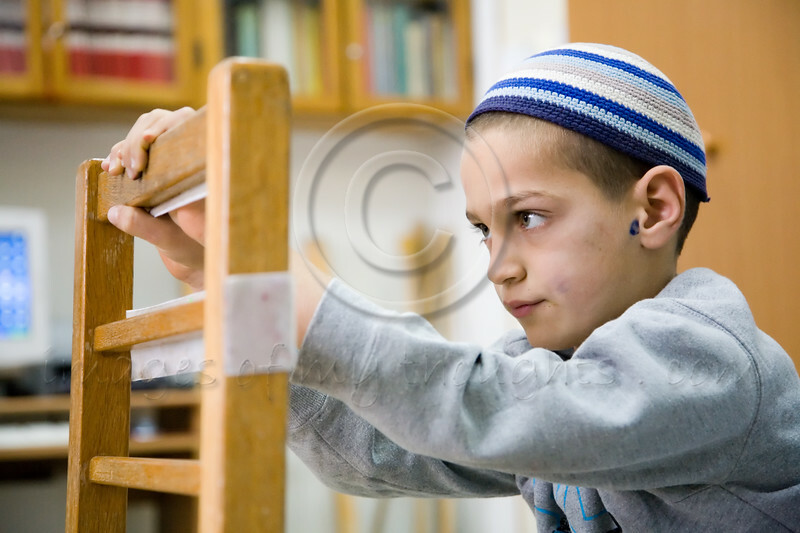 malki’s legacy – the story of hate inflicted death nurturing love and giving, nurturing life. i intend to document the evolution of the project on my blog on this page, all its own, as deserved. the page can be found here: https://niralon.wordpress.com/malkis-legacy/ . i’m not sure how wordpress will handle update notifications of a single post. so, if you’re interested in following the project either enter the page address in your rss reader or send me an email request for manual notifications of updates. or you can always click the link above the banner photo. a lot has been happening over the last few weeks. it looks as though we’re finally over the hurdles on the path to beginning this project. i’m very excited to begin! defining the scope of the project is difficult. the malki foundation does so many wonderful things to turn around the lives of families in need of support. 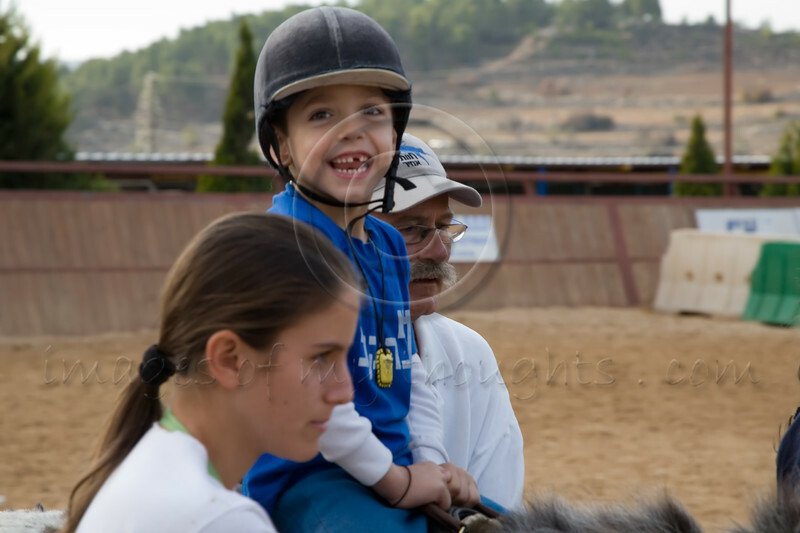 my inclination is to document the children who receive care and therapies with the malki foundation’s support. i want the children and their families to be in focus. i want to show the hardships they must contend with daily, their brave efforts and the unbelievable improvement the malki foundation has brought into their lives. on the other hand, there are many other worthy activities conducted by the foundation. so i’ve decided that at this stage i will include anything that depicts the theme of the project; malki’s legacy – the story of hate inflicted death nurturing love and giving, nurturing life. yad-sarah is a nationwide network of of volunteers aiding disabled, elderly and housebound people, providing home care to thousands. 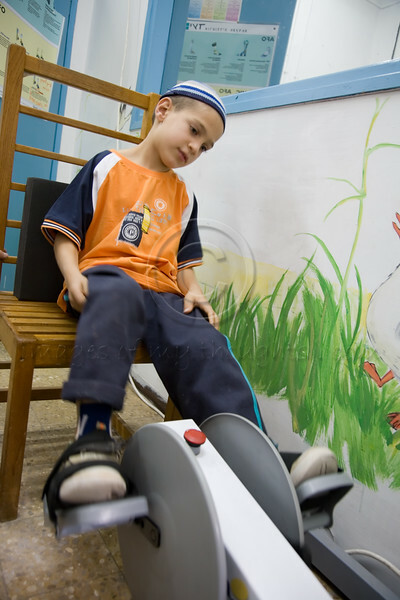 taking advantage of yad-sarah’s national coverage and infrastructure, the malki foundation has teamed up with yad-sarah to offer long-term loan of specialized equipment for disabled children, not previously available through yad-sarah. 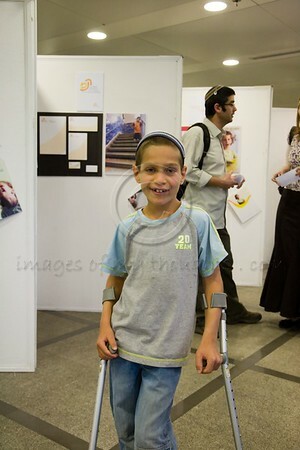 families in need can now try out different types of equipment for up to a year, for free, before investing thousands of shekels in purchasing very unique and expensive devices meant to improve the quality of their disabled child’s life. often, before the year is over, the child has grown, his requirements have changed, and the family can move on to a free loan of the next type of equipment they need. 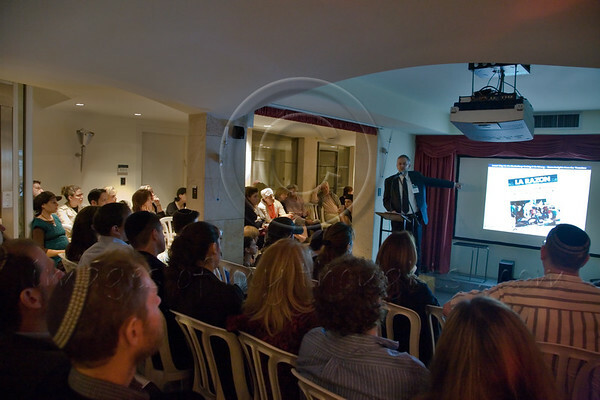 15 november 2007 – keren malki grants application team meeting at the keren malki unit at yad-sarah in jerusalem. a photo of malki and haya on the shelf on the right serves as a reminder of a special relationship of love, concern and dedication. 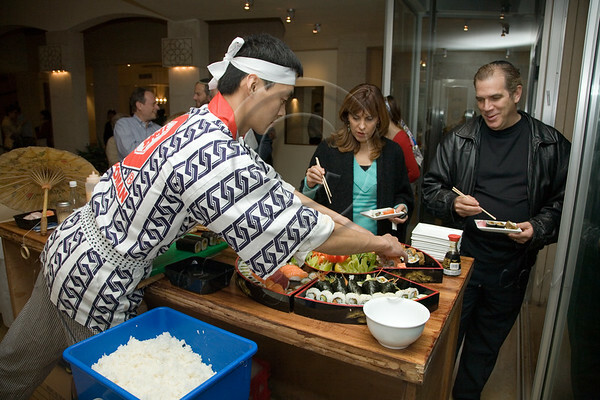 sunday evening i was a guest of keren malki at an extraordinary event in raanana – “a sushi night out to benefit keren malki”. but the highlight of the evening for me wasn’t the sushi but rather two very touching presentations. the first, by arnold roth, “why do the media keep getting it so wrong on israel? insights from the trenches”. arnold’s insights were fascinating, especially his special perspective as a bereaved father and founder of keren malki. the second presentation by dr. sharon ‘x’, a medical professional and mother of a special-needs child. dr. sharon described her family’s ordeal in detail, telling of her son who suffered internal bleeding in the skull after birth and brain damage. doctors’ prognosis for the baby was depressing, to say the least. he would suffer extreme retardation. he would never walk. he would never talk. he should be institutionalized. but he was not. dr. sharon and her spouse decided he would grow up at home; with his parents, with his siblings. when the child was about two years old the family found themselves on their knees, financially. they were more than willing to continue caring for their son, but they were unable to continue the special therapies they were sure he required. that’s when they learned of keren malki. the foundation gave financial support to assist their son with therapies the doctors said were worthless with no chance of success. but the family would not give up. dr. sharon displayed photos of her infant son with a huge un-proportional head, lying on his back, staring blankly into the air. this was how the neurologists were sure he would spend the remainder of his life. 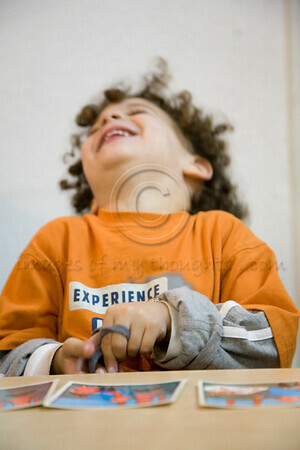 then she displayed a video, of the same son, a few years later, playing soccer assisted by a rear-walker. this was a heart warming, first hand, testimony of the miracles enabled by keren malki. Malki Roth would have celebrated her twenty-second birthday today. 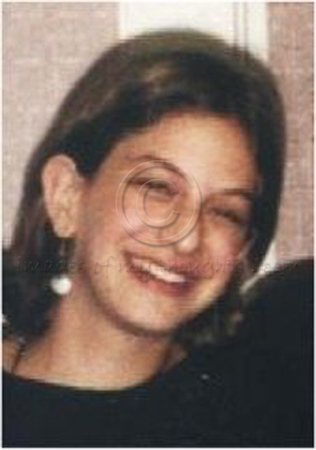 She was born in Melbourne on 27th November 1985 and died in Jerusalem on 9th August 2001. Her life ended tragically along with the lives of fourteen other innocent people when a bomb, carried inside one man’s guitar case, exploded in a pizza restaurant in the center of Jerusalem. The background details are here. Malki’s family established a foundation to honor her life and remember the goodness of their vivacious and pretty oldest daughter. The legal formalities for Keren Malki were completed within the thirty day period of mourning after her death. The registration certificate issued by the Israeli authorities is dated 11th September 2001 – one of numerous ways in which the Roth family’s tragic experience has become intertwined with the spreading global scourge of terrorism and 9/11. Keren Malki helps Israeli families wanting to give their special-needs the best possible care in the home. 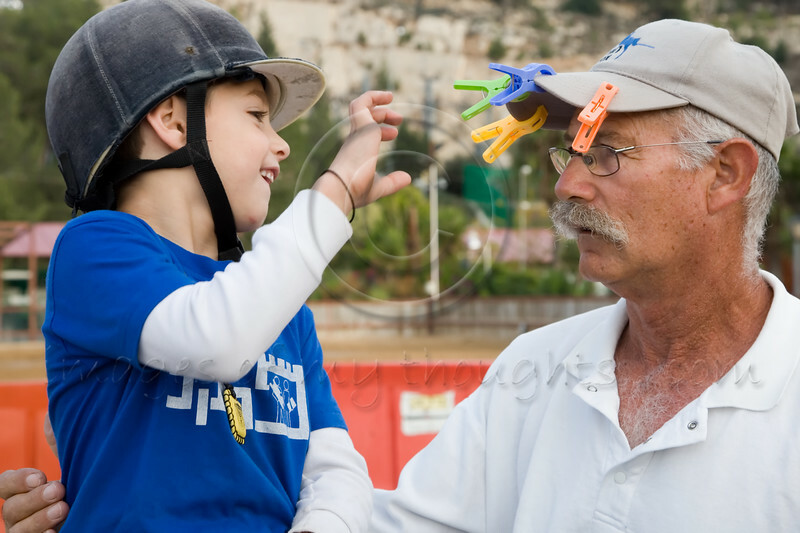 Israel is blessed with fine, quality institutions that address various aspects of the challenge of raising a child with disabilities. 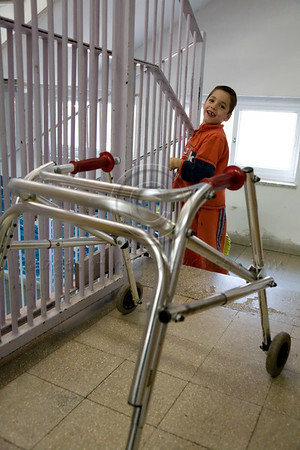 But families in Israel who prefer home care over institutionalization for such children do not have an easy time. They are frequently left to fight lonely battles against the system, while having to fund a variety of therapies and equipment which can quickly drain their resources. The two programs created by Keren Malki address the cost of therapies and the availability of expensive equipment. 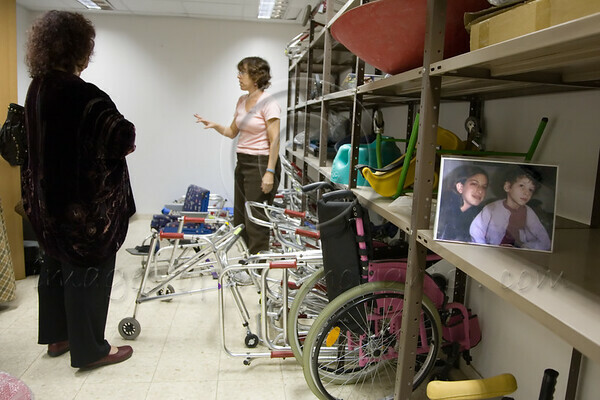 The first, a joint venture with the Yad Sarah organization (called “The Keren Malki Unit”) enables families to get long-term loans of home-care equipment like walkers, standers and special chairs at absolutely no cost. The second, Keren Malki’s “Right to Nurture” program, allows parents to get the best available para-medical therapies for their child, and be reimbursed for 75% of the cost. 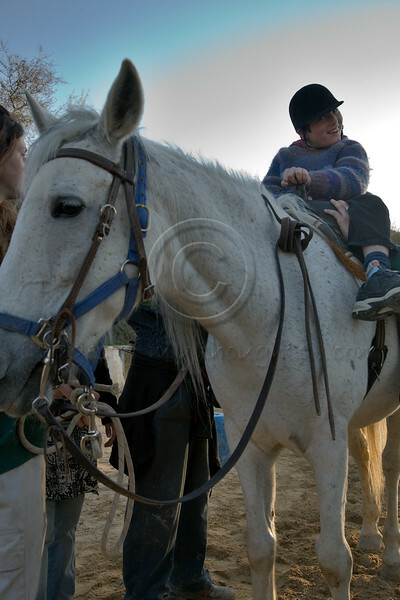 Physical therapy, occupational therapy, speech therapy, therapeutic horse-riding and hydrotherapy are all covered by the program. In the past month, the twenty-thousandth therapy was funded by Keren Malki. 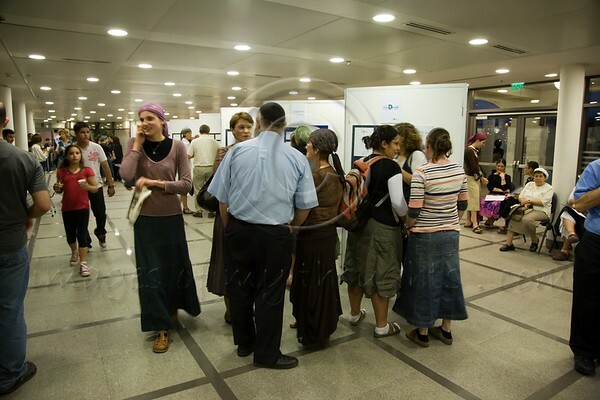 In keeping with the strictly non-political nature of its work, Keren Malki gives it support to Israelis without regard for such loaded issues as religion or demography. Many of the recipients of our programs happen to be Christian, Moslem and Druze Israelis. 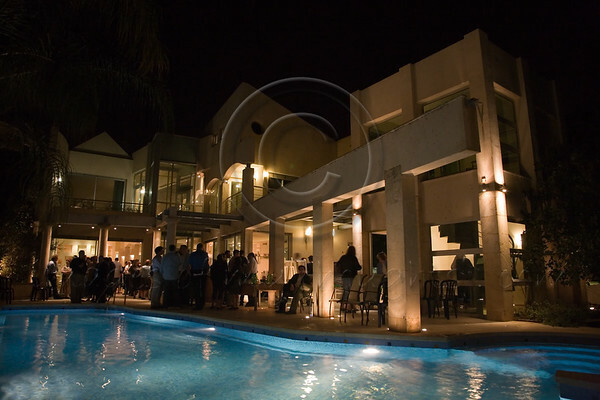 A newly-formed support group in Ra’anana, a suburb of Tel-Aviv, held a successful and very well-organized evening (“A Sushi Night Out for Keren Malki”) a week ago, attracting well over 200 locals and raising much-needed money from enthusiastic donors. 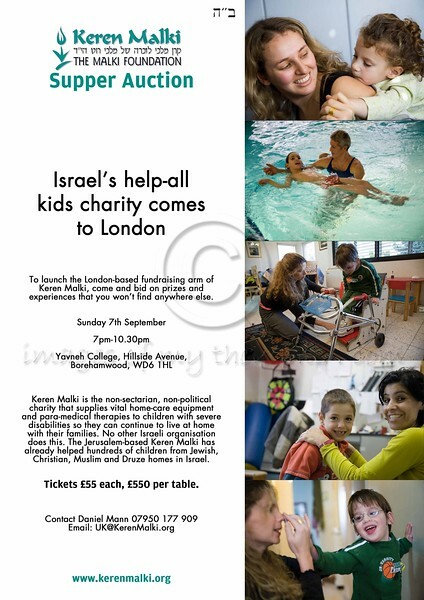 A committee in London was formed this month and Keren Malki UK is planned to be announced in the coming weeks. Melbourne’s Mizrachi Synagogue recently dedicated the Sabbath before Jewish New Year to fund-raising among its members for Keren Malki’s benefit – and decided to make this an annual event. Last month, the Hebrew Institute of Riverdale, New York, held a Saturday night film-screening of the Canadian documentary film “Impact of Terror” in which the Sbarro bombing and its aftermath are the central theme. The evening raised donations for Keren Malki. Arnold Roth took part in the ‘Overcoming Extremism’ conference (as a guest of the organizers, the Center for Strategic & International Studies) in Washington DC in October, taking advance of his participation to extend awareness of Keren Malki’s activities. Several Jerusalemites pooled their energies and mailing-lists this month to hold a combined forty-something birthday – asking their guests to make donations to Keren Malki in lieu of gifts. Please help us safeguard the continuity of the good work being done in the name of Malki. Please pass this along to your friends, and please remember Keren Malki when you are considering your next donation to worthwhile causes. yesterday i met a charming young man with beautiful blue eyes. i’m going to call him M. M was born in a posterior position 7.5 years ago. at the age 0f 4-5 months his mother began to sense something was unusual but the pediatricians accounted it to maternal hysterics. at the age of 1 year M was diagnosed with neurological and other problems and began serious medical care, surgery and therapy. 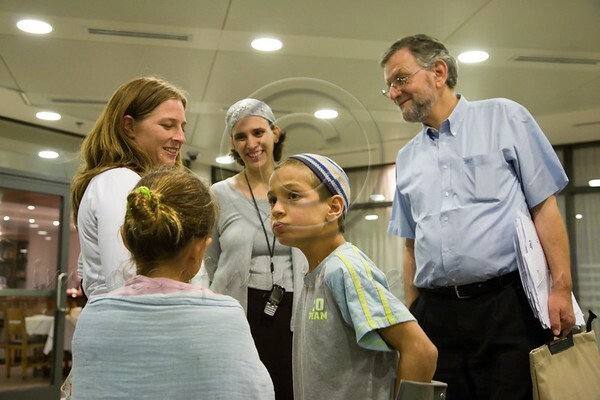 M’s family has been assisted by keren malki for the past three years. 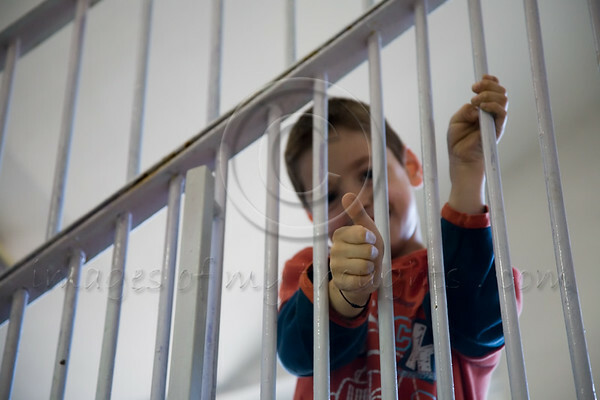 they testify that without help they would never have been financially able to provide M with the treatments he requires and with keren malki’s assistance M has achieved things that other boys his age only dream of. actually, even M’s family thought these were only dreams until M proved them wrong. i’m going to hold back on these achievements for future posts. M had physiotherapy yesterday. 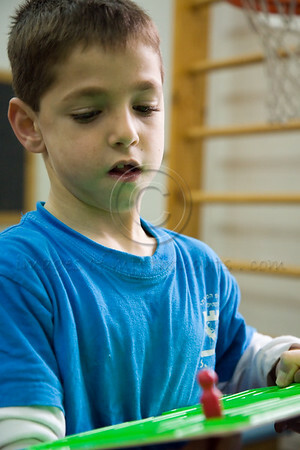 a 45 minute session in which he worked out with seriousness and concentration not typical of his age. his thoughts and energy very focused on the exercises he is assigned. 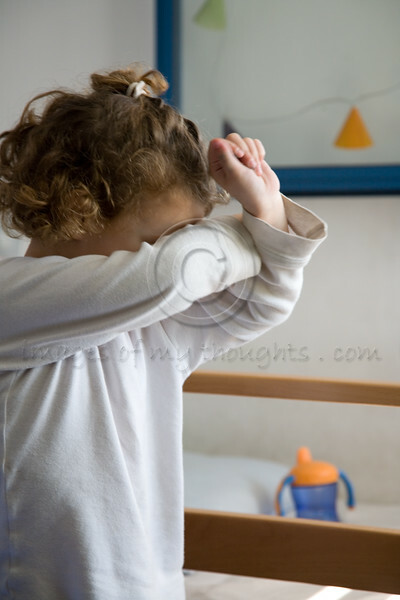 i think the therapist’s biggest challenge was to slow him down – the scabs on M’s elbows and scars hidden on his scalp proof of M’s decisiveness not to let anything slow him down. And that is already a reason to be happy. And this is reason enough to be happy. Each of us has a way of arriving. We all have a way back, too. And a place in the World to Come. So you better start dancing now. In the last year of her life, Malki – a gifted musician – wrote the words and music of a song. She hoped to enter it in a school musical competition. Though she completed the song and taught it to her friends, she did not manage to submit it in time for the competition. Like most girls of fifteen, she thought she had all the time in the world. Her family became aware of the song’s existence for the first time when visitors mentioned it in their home during the week of “shiva”, mourning Malki’s death. 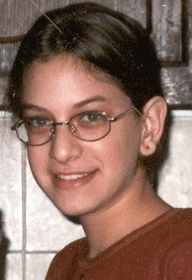 In a spontaneous expression of sympathy and sadness, Malki’s friends had fanned out across Israel during that mourning week in the summer holidays of August 2001. 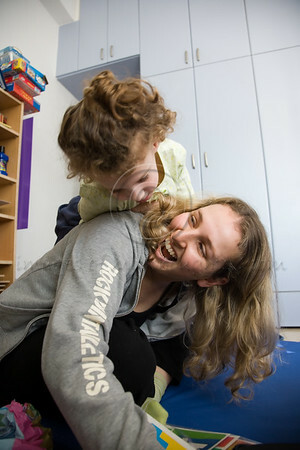 During that week, they taught Malki’s song to hundreds of children and teenagers attending the Ezra youth group summer camp and in other summer youth camps throughout Israel. Since then, the words and music of this lovely creation have continued to be passed along via an informal network of teenagers in Israel and beyond. Awareness of Shir Lismoach (in English “A Song of Joy” – or simply Malki’s Song) has spread far. It’s upbeat, optimistic and happy – just as Malki always was. 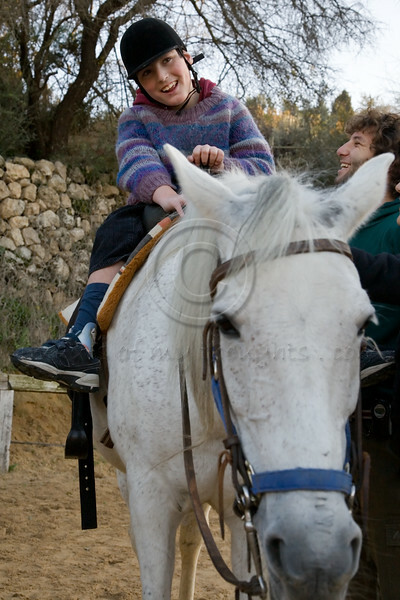 while riding niki, O rarely stops smiling. and what a beautiful smile! a real joy to watch! How can I compress my Malki’s fifteen years into a mere few words? How can I sing her praises without sounding hyperbolic? And, the greatest challenge, how can I endure the pain that this will undoubtedly bring? Malki handled all her school and teacher problems on her own. Shopped for her clothes without me. Conducted a very active social life at Horev Girls school and in her youth movement, Ezra. During her last two years, she was rarely at home. So I had to look hard for ways to lend her a hand. A lift by car to her flute lesson now and again to save her the short walk. A quick dash in my car to hand her the lunch she made but forgotten on the kitchen counter. A pretty new blouse I thought might grab her. A few packets of her favorite gum. Small gestures. But the help she gave me was always on a grand scale, in ways that truly mattered. 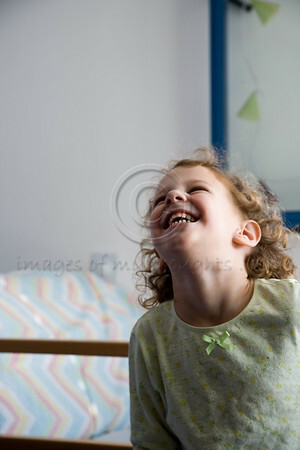 I could count on Malki to calm down her eight year-old sister who has a tendency to become irate or rebellious. Taking her into her bedroom, they’d chat a while; this would somehow win her over. Malki would then proudly present me with a cooperative little girl eager to brush her teeth, finish her homework or do whatever it was I’d been insisting upon in vain. When I would collapse on the couch after an exhausting day, Malki appeared at my side with my pillow and blanket, and gently settled me down. She never missed a chance to compliment me when I dressed up for a simcha or wore a new outfit. When my husband would phone home from one of his overseas business trips, Malki would first ask him how he was feeling and how his meetings were panning out. Only then would she enquire about the items she’d asked him to buy her. (I, on the other hand, would launch pell-mell into my long shopping list, along with a litany of the woes I was enduring on the home front by myself.) If she were spending some time downtown, she would call home and offer to do errands for me, aware that I rarely get out of the house. 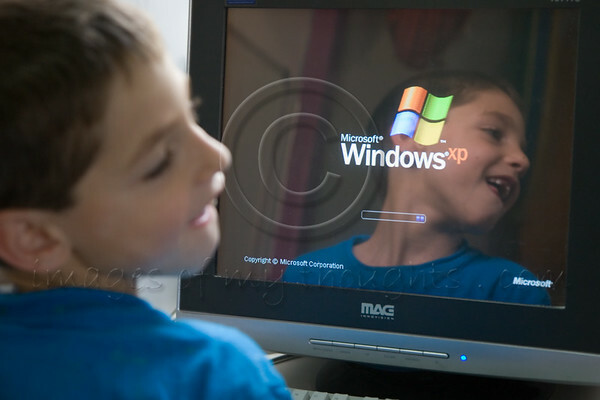 Then there was her unique relationship with Haya-Elisheva, our youngest child, now six-and-a-half, who suffers from global and profound retardation as well as an extreme epilepsy condition called Lennox-Gastaut. Early on, when Haya was hospitalized, Malki spent many hours at her side, relieving me or simply keeping me company. 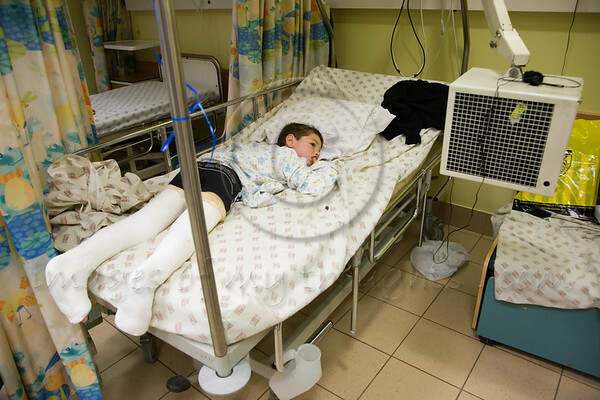 She was only eleven at the time but once alerted me to the fact that a nurse had hooked Haya up to the wrong IV drip. On another occasion she was the first to notice a croupy cough that turned out to need antibiotics. As a result of her competence, I grew to lean on her – perhaps more than I should have. In one of several diaries she left behind, she confessed that she would be happy if we had put Haya away in an institution-though to me she insisted that she preferred to keep her at home. 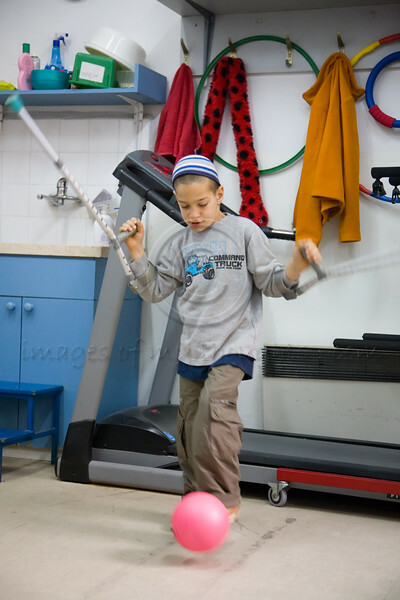 Despite the challenges, Malki was well-balanced enough to develop into a wholesome, active teen-ager. Her ability to see the bright side of things, to concentrate on the “half-fullness of the cup” became her trademark. Many of her close friends have written to tell us how Malki constantly inspired them to fight despondence, be happy, utilize every moment for fun but worthwhile activities. She achieved this in a variety of ways. One was the cards she sent to her friends: birthdays, holidays, returns from vacations, a disappointment, whatever. On the cover, an artistic decoration alongside an apt poem or quotation she had read somewhere that had touched her. On the back – a personal, original note. Another was the intense, empathetic heart-to-heart talks she had with her friends. In her diaries, these are often mentioned as the highlights of her day. Yet a third medium of uplifting was music, an area in which she was multi-talented. 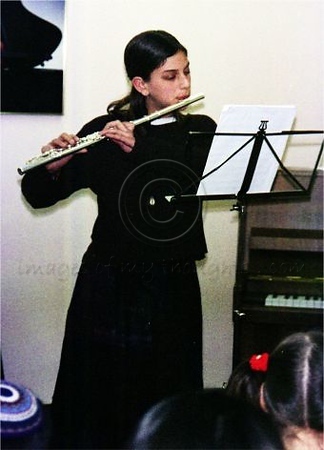 She studied recorder and flute for some ten years and acquired impressive skill in both. When her school or youth movement organized some event she never failed to contribute with either solo or group performances. At mid and end-of-year concerts of the neighborhood conservatory where she took lessons, Malki’s playing always reduced me to tears of nachat. She also taught herself to play guitar and, I’ve been told, would lug it around practically everywhere, and strike up group sing-a-longs at every opportunity – even on the school bus. Needless to say, the songs she and her friends sang were what are dubbed here “shirei neshama” – songs of the soul. Once Haya’s condition stabilized somewhat and I leaned on Malki’s help in that area a lot less, I made a great effort to “normalize” our family life as much as possible. Malki’s contacts with Haya were more pleasurable, and her love unadulterated. On those rare occasions when she was home relaxing, Malki would sit Haya in her lap on an armchair. At night, she often took her into her bed and slept beside her. She became the only other family member capable of feeding Haya and relieved me thus from time to time. Her relationship with Haya did not satisfy her urge to help those less fortunate than herself. She exhibited an amazing sensitivity to all kinds of disabled people. One summer she helped a local single mother with her profoundly disabled child suffering from the degenerative Canavan’s Disease. His limited responses were hardly noticed by others but elicited enthusiasm from my Mali (the name we used inside the family). At school, she gravitated towards the group of learning-disabled girls who study in a separate but parallel class. She developed genuine friendships with them and urged her teachers to include those girls more frequently in joint activities with the other students. 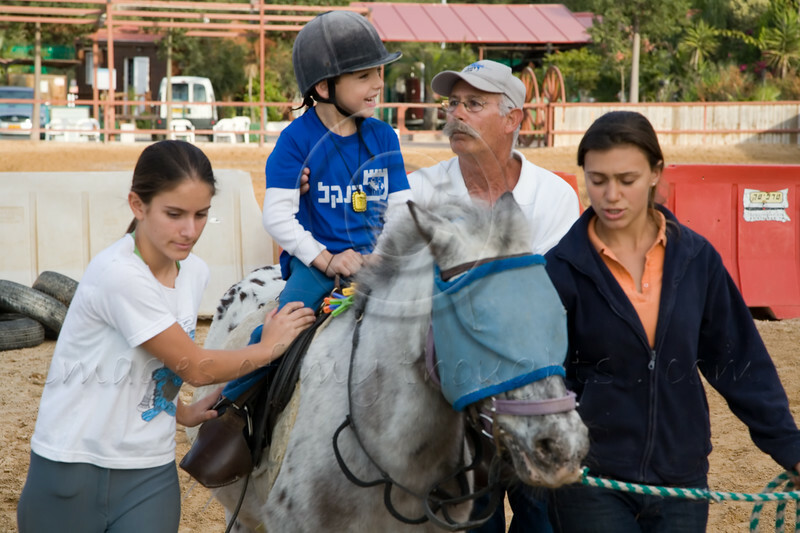 Two weeks before her death, Malki volunteered with a girlfriend at a sports camp located in the Galilee (arranged by the Etgarim organization) for disabled children. 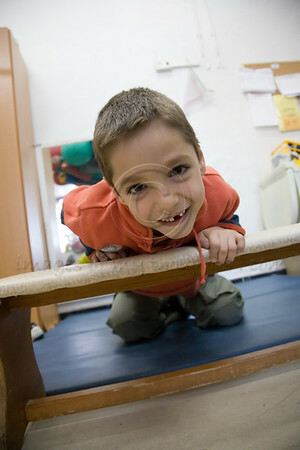 During the five days they were there assisting the counselors, Malki’s gentle, caring way touched everyone. Many of the people associated with Etgarim travelled long distances to comfort us during the Shiva-one trekked all the way from Kiryat Shmona at Israel’s northernmost edge and back in one day, a four hour drive each way-and related incredible stories to us about Malki. One of the counsellors who had supervised her remembered the farewell chat he had conducted with the volunteers the night before their return home. When he asked each of the volunteers to stand up and tell the group what they viewed as the most important feature of their stint, they all emphasized the importance of and satisfaction gained from giving to others. Malki was the last one to speak. We were told that she was the only one who spoke of what she had gained – of the happiness she had experienced in working with the children. Nearly a year before she was murdered, Malki and her friends, at the behest of their youth movement leader, wrote personal letters addressed to G-d, in which they expressed their prayers and requests for the upcoming Jewish New Year. They submitted them to her in sealed envelopes, the intention being to open and read them aloud the following year. The madricha (leader) brought us Malki’s sealed letter during the Shiva. Arnold, my husband has not yet managed to bring himself to read it but, despite a torrent of tears, I did. In it, Malki prayed for success in school and in her youth movement as a counselor (which she was to become several months later). She added the hope that our family would remain close and supportive of one another. Her request for Haya was particularly striking: not for a miracle, a cure or even a dramatic improvement. Ever modest, she asked that Haya learn to somehow convey to us which of our actions please and which disturb her. In the final line of Malki’s letter, in small script because the page had already been filled, I read: “…and that I’ll be alive and that the Messiah should come”. People have told us that our precious memories will eventually bring comfort. But at this point that seems impossible. I cannot conjure up even one of those I have mentioned without crying over the tragic loss that has befallen us, her friends, and the many others she surely would have helped had she been allowed to live out her life to its full course. i was sure it was niki influencing O’s beautiful smile (see november 29th 2007). i was wrong! O doesn’t stop smiling even throughout a hard workout at physiotherapy. but eventually i did discover one of the reasons for O’s smiles – O’s physiotherapist has been working with him since he was 7 months old! this intense six year relationship also allows malka, O’s physiotherapist, to smile. getting rid of the walker! Cerebral palsy (CP) is an umbrella term encompassing a group of non-progressive, non-contagious diseases that cause physical disability in human development. Cerebral refers to the affected area of the brain, the cerebrum (however the centers have not been perfectly localised and the disease most likely involves connections between the cortex and other parts of the brain such as the cerebellum) and palsy refers to disorder of movement. CP is caused by damage to the motor control centers of the young developing brain and can occur during pregnancy (about 75 percent), during childbirth (about 5 percent) or after birth (about 15 percent) up to about age three. It is a non-progressive disorder, meaning the brain damage does not worsen, but secondary orthopedic deformities are common. There is no known cure for CP. 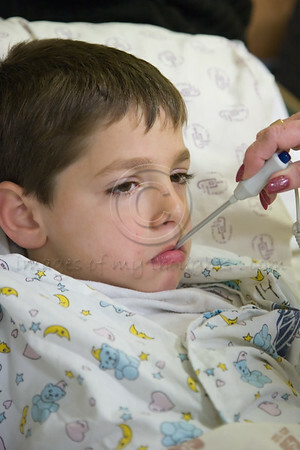 Medical intervention is limited to the treatment and prevention of complications possible from CP’s consequences. All types of CP are characterised by abnormal muscle tone, posture (i.e. 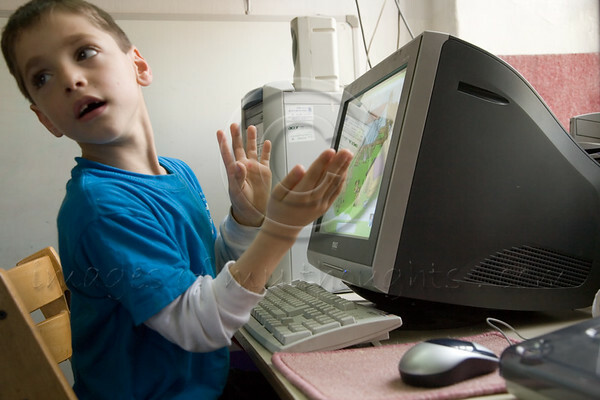 slouching over while sitting), reflexes, or motor development and coordination. There can be joint and bone deformities and contractures (permanently fixed, tight muscles and joints). The classical symptoms are spasticity, spasms, other involuntary movements (e.g. facial gestures), unsteady gait, problems with balance, and/or soft tissue findings consisting largely of decreased muscle mass. 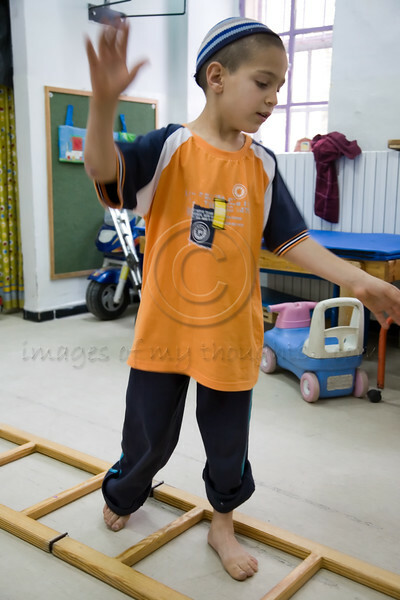 Scissor walking (where the knees come in and cross) and toe walking are common among people with CP who are able to walk, but taken on the whole, CP symptomatology is very diverse. The effects of cerebral palsy fall on a continuum of motor dysfunction which may range from virtually unnoticeable to”clumsy” and awkward movements on one end of the spectrum to such severe impairments that coordinated movements are almost impossible on the other end of the spectrum. Babies born with severe CP often have an irregular posture; their bodies may be either very floppy or very stiff. Birth defects, such as spinal curvature, a small jawbone, or a small head sometimes occur along with CP. Symptoms may appear, change, or become more severe as a child gets older. Some babies born with CP do not show obvious signs right away. Secondary conditions can include seizures, epilepsy, speech or communication disorders, eating problems, sensory impairments, mental retardation, learning disabilities, and/or behavioral disorders. 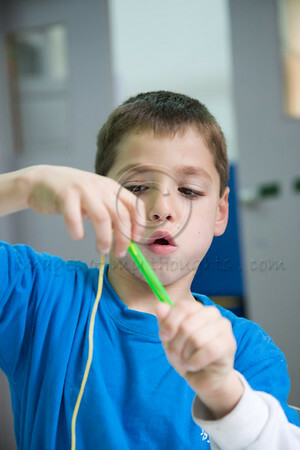 A common misconception about those born with Cerebral Palsy is that they are less intelligent than those born without it. Cerebral Palsy is defined as damage to the part of the brain that controls movement; areas of the brain which define a persons intelligence are not affected by CP. Spastic Cerebral Palsy, the most common form of CP, causes the muscles to be tense, rigid and movements are slow and difficult. This can be misinterpreted as cognitive delay due to difficulty of communication. Individuals with cerebral palsy can have learning difficulties, but sometimes it is the sheer magnitude of problems caused by the underlying brain injury, which prevents the individual from expressing what cognitive abilities they do possess. 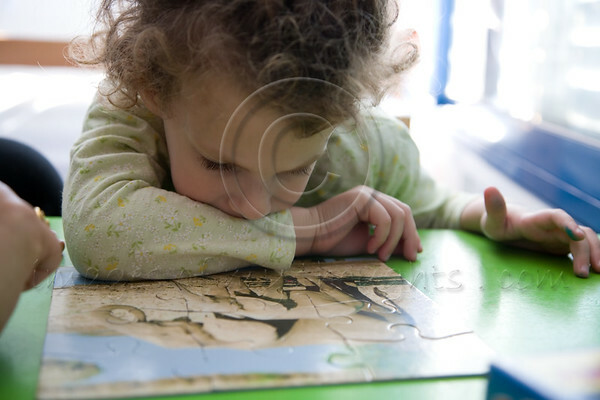 pdd – pervasive developmental disorders – i’m not even going to try to explain this term. from reading a little bit about it what i do understand is that the doctors don’t quite underdstand it. it’s an umbrella term for a series of childhood developmental disorders that have to do with a lack of social and communication skills. A’ cannot speak. just a few sounds here and there that slightly resemble pieces of words but no more. but amazingly, her occupational therapist, michal, has been able to create an intimacy with A that helps her feel comfortable and relaxed. A doesn’t speak but she does communicates! and it’s amazing to see the wonderful bond of love between the two! i was awarded a few glances of curiosity but michal hit the jackpot of beautiful smiles and laughter. speech therapy – one year ago U didn’t speak at all. and if that’s not a good reason to be happy, i don’t know what is! i had the pleasure of meeting Y this week. Y was not having a great day, as often happens to us all. physically he was tense, his muscles contracted, and he could do very little in regard to cooperation and helping himself. Y is 12 ad a 1/2 years old (he stresses the 1/2) and i have learned the of the difficulties of caring for disabled children as they get older and heavier. Y didn’t take me for granted and put me through quite an interrogation; how old am i? where do i live? etc. eventually i think he was happy with my answers because i got a nice smile and an invitation to visit him at home. approximately 80% of patients with cp have varying degrees of spasticity. once spasticity has developed with cp, it never resolves spontaneousy. spasticity adversely affects muscles and joints of the extremities, causing abnormal movements, and is especially harmful in growing children. the known adverse effects of spasticity are inhibition of movement, inhibition of longitudinal muscle growth, inhibition of protein synthesis in muscle cells, limited stretching of muscles in daily activities, and development of muscle and joint deformities. 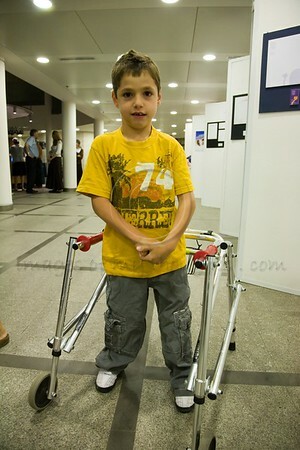 patients with cp do not have deformities of the extremities at birth but develop them over time. spasticity of muscles, along with the limitations on stretching and use of muscles in daily activities, is a major cause of deformities. orthopaedic operations, including muscle release and tendon-lengthening procedures, are also used to treat deformities associated with spastic cp. orthopaedic surgery certainly improves range of motion of the joints and makes it easier for children to move the lower extremities. orthopaedic surgery does not reduce spasticity directly but treats only the consequences of spasticity. along with physical therapy and occupational therapy for stretching, strengthening, and facilitating good movement patterns, the goal is for children to develop maximal independence within the limits of their motor and associated deficits. with appropriate management, many children can lead near-normal lives. O’ has lost his neverending-front-toothless smile. it’s all frowns now and great pain. but it’s only been a few days from the surgery. he blames the casts for his pain, not yet completely realizing the source of the pain is deep inside his legs, underneath the casts. he anxiously waits for the doctor to come in and tell him the casts can be removed, but it will be a long wait – at least 4 weeks. but hopefully, eventually, O’ will be able to forget his walker. as i was visiting O’, a nurse came in and asked what i was for O’. i hesitated and thought a second, then replied: “a friend”. if you’re in jerusalem in june, you don’t want to miss this event! not only will you have a wonderful evening, but donating 120 nis for children with special needs will make you feel good the whole week. i promise! a sneek preview of my project, “malki’s legacy“, will also be presented. please let me know if you’re coming – i’d love to meet you! in a great rush to have a multimedia presentation ready for keren malki’s benefit evening on the 15th, preparations are under way to do this in the most professional manner possible. i look forward to viewing the finished product! last night the malki foundation held an extraordinary event! the students of emunah college displayed their artwork created as a project to design ‘the malki foundation image’. an international panel of judges chose the winning designs that will serve to benefit the malki foundation for years to come. most of the graphic artists used my photos to decorate their designs and it was wonderful for me to see my efforts go to such great use. two special guests of honor attended the event with their families. both were in awe to see their images starring in the exhibition. it was real fun to watch them dashing from one display to the next, crutches, rear-facing walker and all, shouting “there’s one!”, “there’s another!”, brothers and sisters helping them to find the next design with their photos. some very special people were brought together during the event, for the very first time. arnold roth, malki’s father and founder of the malki foundation, had for many years enforced a policy of zero-intervention in the lives of the families the foundation supports. an intentional barrier had been erected in order to preserve the families’ privacy and to provide support without becoming a burden. arnold had never met the children and their families. 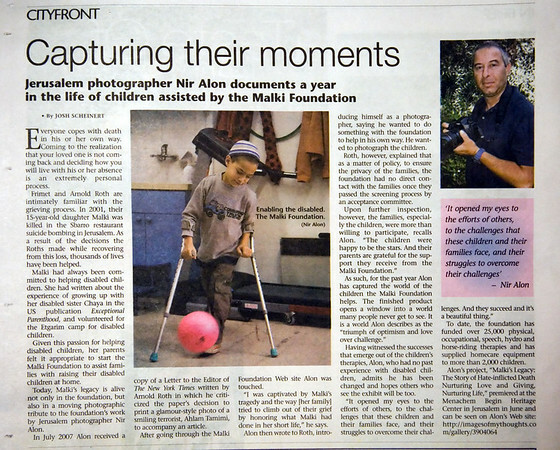 but being a father to chaya, a special-needs child, and being the heart and soul of the malki foundation, for the past year arnold followed my project with interest and i know his heart went out to the beautiful children portrayed in my photos. and the families, on the other hand, full of gratitude for years of support enabling them to provide the para-medical therapies and equipment their children require, had only heard of arnold roth, and admired him from a distance. last night they met – satisfaction and love derived from giving, and the gratefulness and love of the receiver. if there was a geiger-counter for emotions it’s needle would have popped the glass! another highlight of the evening was the ankor children’s choir – a group of beautiful innocent children, all wearing white, singing malki’s song, a song of happiness. i thought to myself ‘what joy this would have brought malki!’ and for a few moments i hid my misty eyes behind the camera viewfinder and dared not look at arnold on my left. 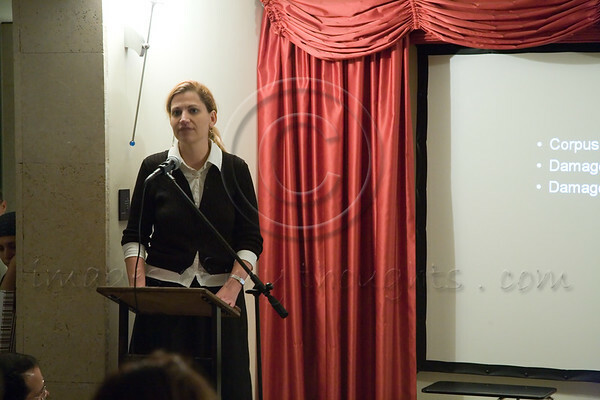 the whole evening was orchestrated by liat behr, a dear lady and co-chairman of the malki foundation. ever so humbly she scampered behind the scenes taking care of all the details to bring this event to the level of success the malki foundation deserves. 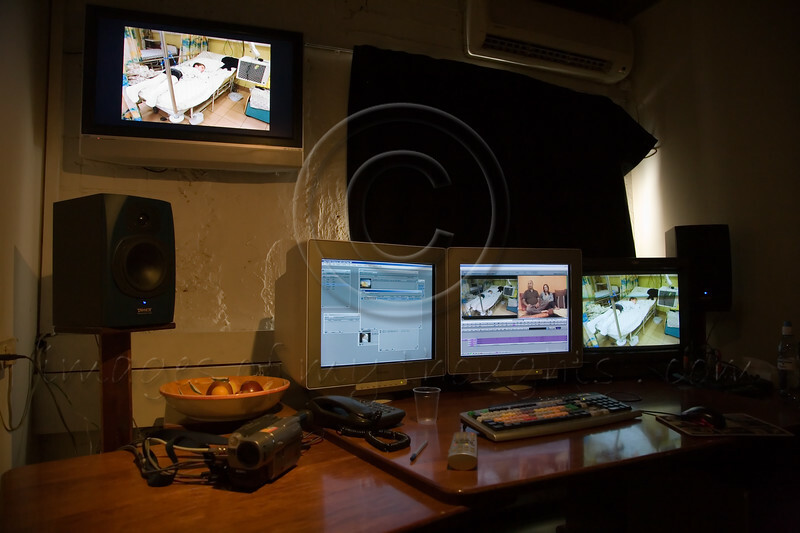 and finally, after dozens of hours of intense production by rachel berger, the malki foundation projects manager, days at the video editing studio, hours producing the sound, weeks bringing it all together, malki’s legacy video was publicly presented for the first time. audience reaction was pretty good. following is the hebrew version. an english version will be available and posted here in two weeks. i promise! 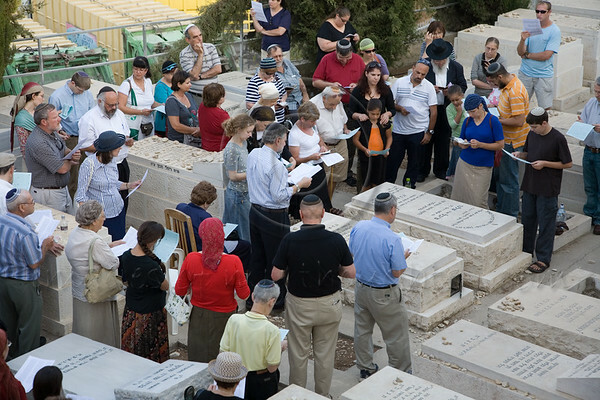 according to the hebrew calendar today is the 20th day of av, marking exactly 7 years since the massacre at the sbarro restaurant in jerusalem on the 9th august 2001.
family and friends assemble at malki’s grave for prayers and the reciting of psalms. Just… Wow, What a work! I love how you bring your point of views to the reader, simply amazing. Seeing these photographs really made a chill in me. These kids are truly something, they really do look like hard workers and give everything they have even when they don’t always understand the problem. And the photographs, oh my! Each and every one of them, just so amazing, smooth, and really send the emotions and the moments. I don’t know how you do it, being able to capture such great photos, true talent. Amazing work and good luck in the presentations – I am sure the audience will love it! the presentation is still in a draft stage and i think that when it’s ready i will hold off posting it here until after the “main event”. what “main event”? i don’t know yet but i promise you an invitation!